West Bengal HS Routine 2019: WBCHSE has announced the date sheet for Higher Secondary Examinations 2019 at wbchse.nic.in. The West Bengal HS Examinations will begin from 26th February to 13th March, 2019. Students of West Bengal 12th class can check Routine 2019 separately for both old and new syllabus. 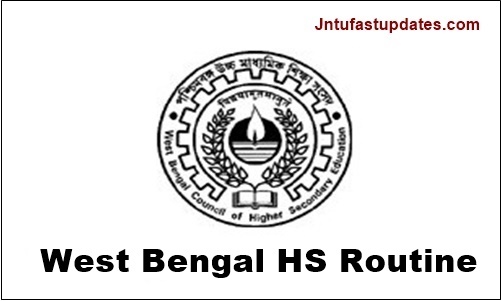 WB HS Routine/ Time table 2019: The Higher Secondary of the Council is to advise the State Government on all matters relating to Higher Secondary Education referred to it by the State Government. The Council has the power to direct, supervise and control the major functions of the Council is to assess periodically the Educational needs at higher secondary level at the state and lay down the General policy for the development of the Higher Secondary Education is to provide for inspection of Recognized Institutions and to provide by regulations, the curriculum, syllabus, the courses of studies to be followed and the books to be studied in Recognized Institutions. Board president Professor Mahua Das told that the examination will start on 26th February and end on 13th March, 2019. Candidates who are interested in Higher Secondary Examinations can prepare well in advance for the exams can download the timetable from the specified below link. Students who are pursuing under West Bengal board of secondary education can know the details of examinations 2019 from the official website: http:/wbchse.nic.in. The new schedule for Higher Secondary(HS) examination, 2019 and annual examination for Class XI, 2019 has been published below with necessary modifications. The Examination of these subjects will be of two hours duration. a) Date Schedule of H.S. Practical Examination 2019 of all Lab-Based subjects excluding MUSIC, VISUAL ARTS and HEALTH & PHYSICAL EDUCATION: 14.12.2018 to 11.01.2019 (Except Hilt Area). b) Date Schedule of H.S. Practical Examination 2019 of MUSIC, WSUAL ARTS and HEALTH & PHYSICAL EDUCATION: 02.01.2019 to 11.01.2019 (Except Hill Area). c) Date Schedule of H.S. Practical Examination 2019 of Hill Area: 15.03.2019 to 30.03.2019. In the last year, there is a exceed number of girls than boys who have attended for Higher Secondary Examinations and they scored best grades in the examinations. We would like to greet “ALL THE BEST” to you for your bright future. We are very happy for you being here. Thanking you for visiting our site and reading our post. We ensure that we will update our site with more fine points regularly. I am sanjoy fast exam to suggetion good luck my life to help sekha mantire bat i cannot exam fast peapar i am Caron. the first one is correct….u can check official website . Old syllabus mean?? My friend failed last year. Is she in old syllabus??? But the tutor did not studied old syallbus..
Why the routine is changing? Is it updated routine of higher secondary education of 2018??? Yes modified routine updated today, please check again. What is the correct date of class 12?